Doing the Ice Bucket Challenge isn't the same as supporting ALS research, and supporting ALS research isn't always the same as saving lives. 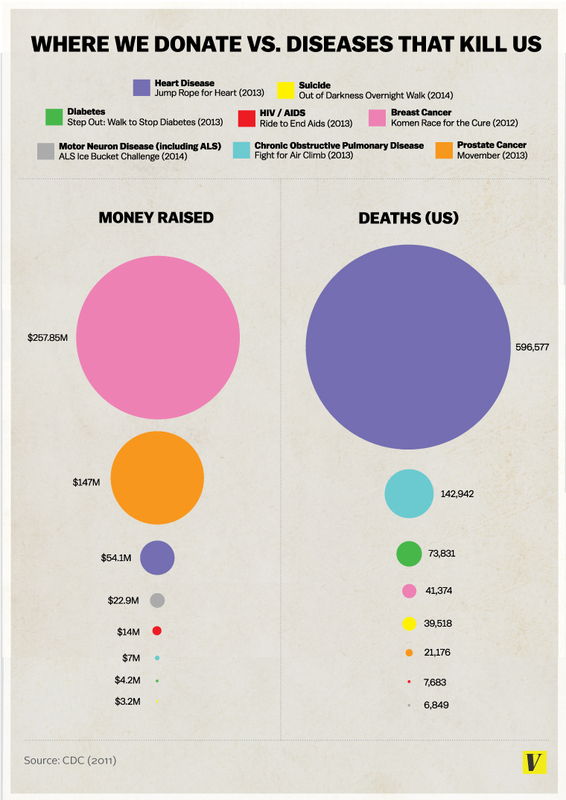 A graphic created by Vox perfectly captures this discrepancy between the causes we donate money to and the diseases that kill us. "You'll notice that large fundraisers can have a pretty significant impact on raising money for causes -- and also that there are big gaps between the diseases that affect the most people and those that net the most money and attention," Julia Belluz wrote for the site. Of course, there are any number of life-altering illnesses worthy of greater awareness, research and understanding. But as the graphic below shows, the latest ice bucket meme or pinkwashing gimmick isn't always the greatest indicator of which causes most desperately need our attention.